Late in the afternoon a terribly loud explosion was heard from high above followed quickly by a number of additional thunderous blasts. Alerted by these sounds witnesses soon found a 4 m wide, 2 m deep crater with a 195 kg mass inside. Another large 65 kg mass and several smaller pieces were subsequently found in the next days and weeks. Estherville has been given considerable attention in the past 130+ years as it is the most massive of only 7 witnessed mesosiderite falls. Mesosiderites are complex stony-irons which have experienced dramatic impacts which have mixed once molten Fe-Ni metal with an assortment of silicate clasts. 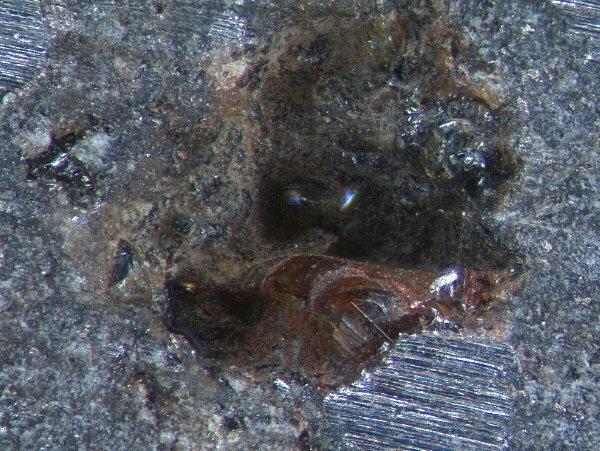 Several larger mesosiderite finds are known, but weathering creates substantive interpretation problems — especially when trying to determine which sulfides, sulfates and phosphates within an exposed meteoritical mass are pre-terrestrial and by products of exposure to the earth's environment. 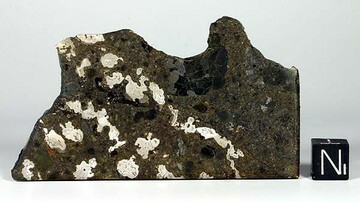 Estherville's Fe-Ni metal (56 wt%), with prominent nodules and frequent Widmanstätten patterns provide ample Fe-rich material for study. Likewise, Estherville's often clastic silicates (~40 wt%)— compositionally dominated by orthopyroxene with accessory plagioclase and other minor silicates — also provide ample 'stony' material for material. Schreibersite, troilite, chromite and other phases account for <5 wt% of the meteorite. Estherville is the 'Type Locality' for two minor phases, stanfieldite (a phosphate) and tetrataenite (Ni-rich tetragonal metal), discovered several decades ago. As the research referenced here spans over a century, the reader should be alerted to changing nomenclature conventions used by various authors which are difficult to render with complete consistency. Thus, the 'whitlockite' reported here is referred to as 'merrillite' by other equally competent sources. Description: Plagioclase grains are somewhat variable in composition, but are normally unzoned. Description: Present in anorthositic clasts. 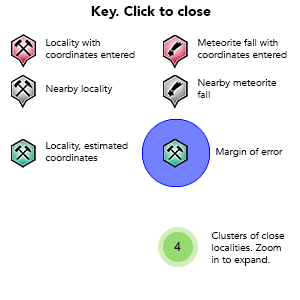 Reference: Grady, M. M. , Pratesi, G. & Moggi-Cecchi, V. (2015) Atlas of Meteorites. Cambridge University Press: Cambridge, United Kingdom. Description: Enstatite has both a general definition as magnesian Fe-Mg pyroxene (MgO mol%> FeO mol%) and as very Mg-rich pyroxene or even nearly pure Mg pyroxene [The latter usage is usually preferred in the meteoritical literature]. Almost all Estherville orthopyroxene contains a significant ferroan component. Reference: Geochimica et Cosmochimica Acta, Volume 54, Issue 11, November 1990, Pages 3197-3208; Fuchs L H (1967) Abstract of paper presented at the twelfth annual meeting: Stanfieldite, a new phosphate mineral in stony-iron meteorites. The Canadian Mineralogist 9, 289-290; Ramdohr, P. (1973). The Opaque Minerals in Stony Meteorites. Elsevier Publishing Company: Amsterdam; London: New York. 245 pages; Shepard, C. U. (1879). On the Estherville, Emmet County, Iowa meteorite of May 10, 1879.: American Journal of Arts and Science (3rd Series) 18:186-188. Description: Orthopyroxene(Fs29) [According to Powell (1971)] is mostly described as 'Hypersthene' in much of the meteoritical literature. Reference: Shepard, C. U. (1879). On the Estherville, Emmet County, Iowa meteorite of May 10, 1879.: American Journal of Arts and Science (3rd Series) 18:186-188. Description: Dakota Formation widespread in western Iowa, lower sandstone-dominated Nishnabotna Member, upper mudstone/shale-dominated Woodbury Member. Correlative Windrow Formation found as erosional outliers in northeastern and north-central Iowa. Primary lithologies: sandstone, quartzose, very fine to medium grained; mudstone/shale, light to dark gray, variably silty-sandy, noncalcareous (Woodbury Mbr.). Secondary lithologies: sandstone, medium to very coarse grained, part pebbly to gravelly, locally cemented by iron oxides (Nishnabotna Mbr., Windrow Fm. ), gravel, quartz and chert clasts; siltstone; mudstone, red, pink, yellow-brown, black (carbonaceous). Minor: lignite; siderite (concretions, pedogenic sphaerosiderite pellets, cemented siltstone); massive iron ore, silty to sandy (Windrow Fm.). Maximum thickness Dakota Fm. 500 ft (150 m), commonly 100-300 ft (30-90 m); Windrow Fm. 40 ft (12 m). Shepard, C. U. (1879). On the Estherville, Emmet County, Iowa meteorite of May 10, 1879.: American Journal of Arts and Science (3rd Series) 18:186-188. 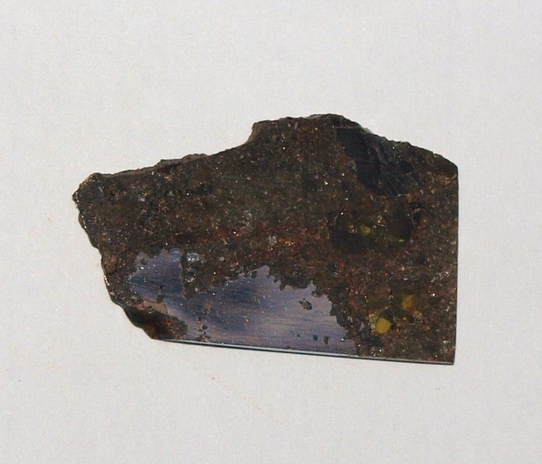 Witzke, T. (2011): Stanfieldit-Kristalle aus dem Meteoriten Estherville (Mesosiderit A 3/4). Aufschluss 62, 119-123. Grady, M. M. , Pratesi, G. & Moggi-Cecchi, V. (2015) Atlas of Meteorites. Cambridge University Press: Cambridge, United Kingdom. 373 pages.